“Danny Green, aka Laish, is known for honest, self-reflective songs and stunning live performances. Danny possesses a distinctive, plaintive tenor which is deep, richly textured and affecting. Gentle fingerpicked acoustic ballads and robust art rock jams about relationships failed and survived. Currently based in London, Danny Laish has had an impressive independent career performing both solo and with a full band. Prominent shows include some of the UK’s most prestigious venues: The Union Chapel, The Roundhouse, Barbican, St Pancras Old Church and Kings Place. Laish have toured extensively across UK and Europe and released two critically acclaimed albums. Festival performances at End of the Road Festival and Cambridge Folk, and shared stages with Grizzly Bear, Beach House, Richard Dawson, Martha Wainwright, Rozi Plain, Wave Pictures and Jason Lytle. Radio plays from BBC 6 Music's Gideon Coe, Chris Hawkins, Marc Riley, Tom Ravenscroft, The Late Junction, plus Amazing Radio and Totally Radio. In Feb 2016 Laish released a brand new EP for the first time through Indiegogo. Donations from this EP will go towards funding 14 new songs for ‘Pendulum Swing’, the widescreen sequel to 2013’s universally praised Obituaries album. 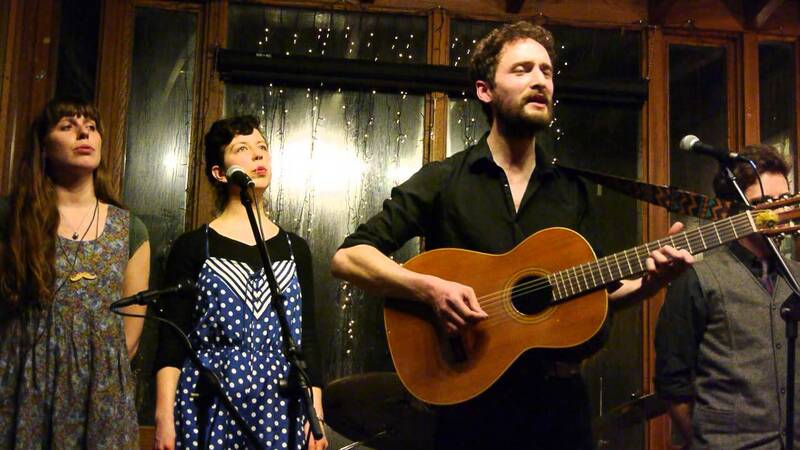 In 2014, Danny started We Come Alive, a regular night in London and a cover song project involving contributions from many excellent contemporaries including Ezra Furman and David Thomas Broughton. Laish was also previously an integral member of the legendary group of songwriters in Brighton, the Willkommen Collective”. Learning to Love the Bomb might be a Dr. Strangelove-esque compound- images of Peter Sellers might flash to mind- yet it is a song that is being hailed and lauded. While Danny Green’s moniker presents Indie confessionals; they are delivered with heart, upbeat and optimism. Just looking at our hero and you are struck by his geek-chic- not a derisive term; it is a great look- and understated cool. Laish is a musician that impressive you before he has even sung a word. That inimitable mix of fashions, facial hair and (sly grin) are charming and distinct. So many artists are either dressed-by-committee- bands bedecked in leather stuck in a ‘70s Punk time warp- or expend little effort standing apart. Luckily, we have an artist who has taken great cares to distinguish (himself) from the crowd. It is not just the fashion that stands Laish apart: The music and videos are among the most exciting I have heard in years. That plaintive, everyman voice- delivering every word with purity and honesty- puts me a little in mind of Charlie Fink (Noah and the Whale’s leader). Whether performing a retrospective assessment of a fallen muse- a relationship that has hit the rocks- or addressing something potentially heartbreaking: At the end, there is always that get-on-with-it-spirit. Laish is resolutely British and stoic: He can recognise and address pain but will not let it get him down. In a music world where the opposite is true- young singers contended to be self-flagellating and moribund- it is a refreshing to find someone that makes you more hopeful. Before I get down to business- looking at Laish’s progression and new single- it is worth addressing music videos and crowd-funding. The latter is something being more-often-employed by musicians. The financial realities are harsh and repressive: It can cost hundreds of pounds putting together a three-track E.P., for instance. From studio hire and recording- depending on where you go it can be extortionate- to the music videos and promotions: The final bill (when said E.P./song is unveiled) can bankrupt the best of us. Laish’s new campaign- images of Peter Sellers might flash to mind- yet it is a song that is being hailed and lauded. Laish’s new campaign-https://www.indiegogo.com/projects/laish-in-the-studio#/- hopes to raise funds for his forthcoming album. About 60% of the way there- as I write this- there is just one day left- to get funded and achieve his goals. I do hope he does it- it might be a tight race to the finish- but it raises a wider point. The realistic cost of music is mounting and almost unrealistic. New musicians are pouring in thick and fast- which drives the costs up to begin- and are unaware just how challenging it can be (getting finances sorted). I am not sure what a real-world solution would be: Maybe bigger companies- Microsoft, Samsung; Google and Apple- could agree upon a solution. Just short of a tontine; I cannot see it happening: The bigwigs of technology are not as charitable as they should be. It is clear something needs to be done. Too many musicians are struggling/having their dreams extinguished because of sheer cost. I wish the best for Laish- and hope he gets full funding- as he is one of the most original and exciting musicians in the U.K. Given the state of the world- just this morning, terrorist attacks have occurred in Brussels; ten people have been confirmed dead- there are fear and unhappiness permeating. We all need comfort and something to distract our minds from the ‘realities’ we face. In addition to an impressive new track: The music video for Learning to Love the Bomb has been receiving serious buzz and kudos. The music video (as a concept) seems to be dying and in its dotage: How many memorable music videos have you seen lately? The very reason I ‘found’ Laish was via a former Cambridge Footlights colleague- the video’s director, Ruth Pickett. Knowing her abilities and talent- an Emmy-nominated writer-comedian-director-it is perhaps not a surprise she has directed a terrific video. It is the humour (of the video) that is captivating people: The sly- and somewhat exaggerated- looks to camera; the cheekiness and retro fashions- it is a pleasurable experience for the senses. Many would argue music videos are inessential and a burden: A needless expense in order to conform to a YouTube generation. With his cohorts- the backing band Danny Green has supporting: Tom Chadd; Matt Canty; Felix Weldon; Talitha Gamaroff; Sara Mae Tuson- joining in the fun: You have a video that not only visualises the song perfectly: It stand aside on its own merits. Pickett is commonly-known as a writer-performer but seems like a natural-born director. Providing a comedy arc/narrative- the scenes and story for the video- capture your eye and compel you become involved. I keep watching the video over and over: It seems many other people share my passion. If the music video is dull and uninspired- about 90% of them to be fair- then yeah, it is not going to impress people. If you get it right and make something original: It will not only boost a song’s appeal but it will inspire wannabe directors to pick up a camera and create something wonderful. When looking at Learning to Love the Bomb- and how it compares to older work- one must look back and see how Laish has progressed. Laish was unveiled in 2010 and boasted nine songs of personality and passion. From We Speak the Mantra’s finger-picked introduction; the dreamy (female) vocals and redemptive lyrics- everything will be okay- you are invited to a banquet filled with succulent treats and fulfilling cuisine. To Do sees Laish (and his band) at his most haunting and ethereal. The regimental dignity of the percussion-and-guitar combination is backed by yearning vocals and an unforgettable sound. The entire album proved how consistent and qualitative Laish is. Obituaries was released three years ago and showed an evolution and step forward for the London-based artist. Although the sound and subjects remain roughly the same: The confidence and quality seems to have gone up. Obits is a strange and unsettling song that shows a departure: Never has the London outfit sounded as immediate and gripping. Leading to plodded percussion: The vocal that joins the fray ensures every listener stands to attention and hears every word. Songs are a little longer and more experimental- without losing focus- epitomised in songs such as Visions. Green ups his game as a composer and brings fresh influence into the music. The band themselves seem tighter and more beautiful. Petty Ruiner is one of the most memorable and pretty songs they have ever created (up until that point). Gorgeous strings and wonderful little details combine in a song that lifts the soul and makes the listener reflect. Green- at this point- sounds more confident as a singer and shows more sides to his voice. Not that Laish needed radical improvement at all- the music was rock-solid and amazing to begin- but with every release; you hear the quality and scope increase. Learning to Love the Bomb will resonate with fans of Laish: It is a loyal and dependable song that does not break too far from previous releases. Ensuring those plaintive tones and thought-provoking lyrics remain firm: The song is a triumph that very-much sounds like a Laish composition. With the band at their very peak- they sound utterly gelled and united in every moment- yet another step forward has occurred. Maybe it is the inter-album touring that has strengthened the band. As time elapses, Laish become more confident and assured. Learning to Love the Bomb is one of the most charming and immediate songs Laish have created: Sure to recruit new followers; it is a symphony of delight that seems appropriate for the dawning spring. Whilst there are deep moments and honest (read: some negativity) to be found; the abiding sensation is one of positivity and light. I cannot wait to hear Laish’s new material- in E.P. and album form- as the London troupe seems incapable of disappointment. Few musicians remain consistent, let alone get better with time. For that reason, Laish deserve to followed very closely indeed. Rarely have a reviewed a song whose music video is getting most of the attention. If you are reading this review- strange if you weren’t- I implore you to watch the video: A companion piece that elevates the song and will stay long in the mind. The video’s opening moments see our hero knocked off his bicycle- something you don’t see in London much- and lie (motionless) on the pavement. Eyes open and seemingly doomed: He awake to find himself in a very different place (era-wise; not location). From the 2016 opening; our man awakens in a bygone era. With the song mixing ‘70s Pop/Folk with something current-day (the video) seems rather fitting. The introduction is a perfect blend of synthesiser/electronic sounds and guitar: Dizzying and vibrating; you are powerless to resist moving the feet and nodding the head. Few bands/acts expend much time crafting a nuanced and memorable introduction. I know I use that word (‘memorable’) a lot, but with good reason: After listening to the song; you will have the notes and sounds stuck in the brain. Learning to Love the Bomb’s introduction mutates and develops like a story or travelogue. The guitar- what was once straight-ahead and firm- starts to jump and move; the beat becomes stiffer and a nifty little groove is presented. Before a syllable is dropped; you are invested into the song and compelled. Our man- in the video he gives a lovely little look to camera- is learning to love the bomb. Under the “shell of administration”, the hero- joined in voice by his comrades- is changing his thoughts. It is a “powerful weapon”- delivered with a casual and candid matter-off-fact-ness- and something that seems to be okay with him. Underneath these words seems to be a fear, mind: “We are nearing the ending”. Whether looking at the Cold War-era uncertainty- whether the bomb would be dropped at any moment- there is that acceptance of that Cold War era- again, Dr. Strangelove comes to mind- and the panic that must have pervaded. In spite of the unique and standout lyrics- how many other acts address a topic like this- you are washed in gorgeous vocals and a mellifluous composition. That juxtaposition- between a stark core and heavenly backing- makes Learning to Love the Bomb a song with many layers and plenty of repeatability. Upon first listen- with reviewers head on- I was trying to interpret the lyrics- probably failed miserably- but kept coming back. The second and third visits were reserved for vocal and appreciation: By the fourth or fifth spin I was deconstruction the composition and all its intricacies. Laish have always been noted for their swelling harmonies and tenderness: Here is really comes to the fore. Throughout the song, you are carried and pleasured by a driving beat and head-swinging guitars. Few songs possess such amiable charm and delirious delight. The lyrics may look at impending nuclear destruction; the fact you smile throughout shows what a delight the song is. In the video- can’t keep my eyes from it- the band sway their heads and seem contended with their lot (or too scared to show true emotion). Shades of Noah and the Whale’s early work comes out (when they were positive) but Noah’ never penned a tune as immediate as Learning to Love the Bomb. Just as you become entranced in the chorus- you’ll be singing along before the three-minute mark- the composition demurs. A final guitar note is strummed before a solitary triangle note rings. The drums rumble with bellicose intent- one hell of a performance- whilst the guitars fire back up (electric and acoustic) to signify imminent chaos. Representing bomb-drop and artillery fire; that parable is repeated. Such a bold and impressive mood: The drum-and-guitar combination conspire the imagination to think about unfolding drama and bubbling tension. That quirky triangle zing only adds to the wonder and impression. After the happy-go-lucky nature of the first-half; the song becomes more serious and weary. Perhaps that initial compliance has faded: The chorus delivery seems more forced and fatigued. The drum keeps firing with multi-limb savagery comes back and ensures the thunder will roll. As you think the marriage of convenience- accepting fate and reality- will end with something depressive and tired, you would be wrong. That cheeriness swings back in and the song steps up another gear. Green’s voice becomes less plaintive and serious: A falsetto is introduced and the passion levels rise to palpable degrees. The final moments (of the song) are reserved for that indelible and unshakable composition: Those jiving, skipping notes have infantile charm and a serious sense of intoxication. I have not heard an act as unique and original as Laish: More acts need to follow the example laid out here. As the final notes ring- and Learning to Love the Bomb- comes to its ending; you sit and reflect in amazement. You could mute the song and enjoy the video on its own: Every viewing causes you to grin with inane drooling. A wonderful story and great comedic vibe- Green is a natural comedic hand- have already resounded with multiple listeners. That quality and near-genius video stems from a great talent, for sure. It is impossible to hear Learning to Love the Bomb and not be inspired. There is so much happening; the song is so immediate and instant: Upon the first listen, you are mesmerised and seduced. My solemn hope is Laish continue to produce music and take their sounds around the U.K. Learning to Love the Bomb is (debatably) their most impressive song so far. It has the potential to be spun across national radio- I understand it is already accruing airplay- and can overwhelm audiences around the globe. Whether the band has enough money in the kitty for U.S. dates- one suspects not at this juncture- there will be a demand across the waters. The song’s title/themes might be unfortunately timed- in light of the continued atrocities around the world- but only to those who miss the point altogether. If anything (the song) is just what everyone needs, right now. A song that delivers joy and smiles EVERY time it is heard: Its price is sure to rise on the music scene’s stock market. Few other artists are creating music as pure and wonderful. Congratulations to Laish on a tremendous song- Pickett on an accomplished and delightful video- and brilliant achievement. VERY proud to be British.